Variety cover shoot to celebrate producer Greg Berlanti’s superhero success last year. It's finally official! The Flash will be paying a visit to National City and crossing over with 'Supergirl.' Barry Allen (Grant Gustin) will appear in an episode on Monday, March 28 at 8 p.m. on CBS. No plot details for meeting Kara (Melissa Benoist) have been released yet but the shows creators are estactic to have worked it out to make it happen. While Gustin is used to crossing over with the CW show it was spun off of, Arrow, and helped launch the superhero team-up series DC's Legends of Tomorrow, the Supergirl visit will be the first across television networks. 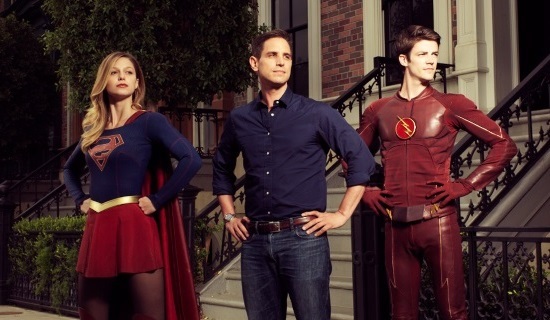 A crossover has been speculated ever since 'Supergirl' was announced but CBS played coy while Berlanti welcomed the opportunity given a chance. Seems like the move will be a great boost to both legions of fans. 'The Flash' is already the CW's highest rated show while 'Supergirl' has been a solid ratings draw at CBS. The crossover helps cement the DC television universe (from Berlanti Productions anyway) as truly interconnected. Other DC Comics-based shows like Gotham on Fox seem to occur in the past with a totally different tone and without metahuman characters. A crossover with Gotham seems unlikely unless the 'Legends of Tomorrow' travel back in time to meet with Detective Gordon. 'Supergirl,' airs Mondays on CBS, stars Mehcad Brooks, Chyler Leigh and Jeremy Jordan, David Harewood and Calista Flockhart. 'The Flash' airs Tuesdays at 8 p.m. on The CW with Candice Patton, Danielle Panabaker, Carlos Valdes, Tom Cavanagh and Jesse L. Martin.